Remember a few months ago when I talked about how animal print is in right now, especially leopard print?! For a while, I’ve been wanting to own a leopard print skirt and I didn’t get to it until Chicwish gave me the opportunity to share what I wanted on my wishlist. 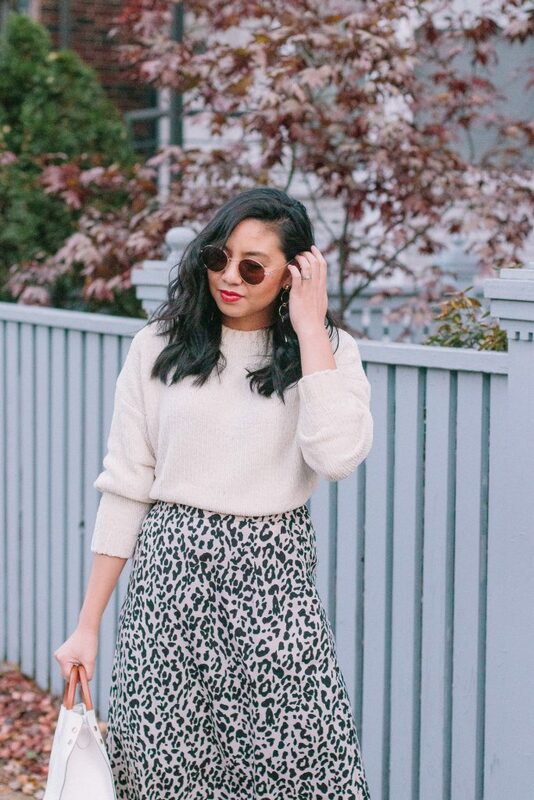 I was so excited to see a leopard print skirt on their site! This Chicwish skirt is exactly what I was looking for in a leopard print skirt. I’m not just saying it because it was gifted. To be fully transparent, anything that has not worked out from Chicwish, I have returned to them. Therefore, if I share any pieces from them, it is because I am excited to share it with you all. It is so rare of me to share anything I don’t like. Not worth my time, ya know? This leopard print skirt has an A-line style, is high-waisted, and has pockets! I feel like sharing anything with pockets is a must! It fits true to size. I’m wearing a size small. The back has an elastic-waist. Since the holidays are coming up, you can easily create a holiday outfit with it. I’m considering for a New Year’s Eve outfit to pair it with my black sequin t-shirt and sock booties. If I end up liking how that turns out, I may share that outfit in a blog post. Or, you can replace my cream chenille sweater with a red chunky knit. Maybe wear a ribbon hair tie (love this bow ponytail holder and this one too!) as an accessory! For this look, I wanted something more cozy so I opted for the coziest fabric ever – chenille! If you’ve ever felt a chenille sweater or cardigan, you know it is so so soft! If you want cozy, you need something made out of chenille. 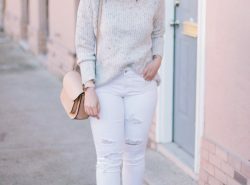 So naturally I grabbed my cream chenille sweater to give this outfit a more cozy vibe. My exact sweater has been going in and out of stock. I suggest bookmarking it if you really want it. That way as soon as it is back in stock, you can immediately get it before it goes out of stock again. 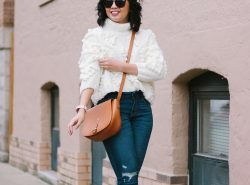 The good news is that I found other similar cream chenille sweaters like this one, this one, and this one. They’re all relatively in the same price range. So what about you? Have you owned any leopard print skirts? If so, from where? I’d love to own more! The skirt is so beautiful and I like how you styled it! Such a cute outfit and I’m obviously LOVING that leopard skirt. So fab! Love your skirt! So pretty with the muted colors and the pop of color in the heels! It’s a gorgeous leopard skirt, and having been gifted only makes it better! I love the shape and colors, also those red heels are the perfect pop of color! Haha right?! Thank you Lydia! Love that leopard skirt! So chic! I actually still don’t own a leopard print skirt — it’s not on my list. But I’m actually oddly obsessed with your chenille sweater. You style it better than the model did. Yes, this chenille sweater is the best! That skirt looks great … animal print without being overwhelming. You styled it well too. 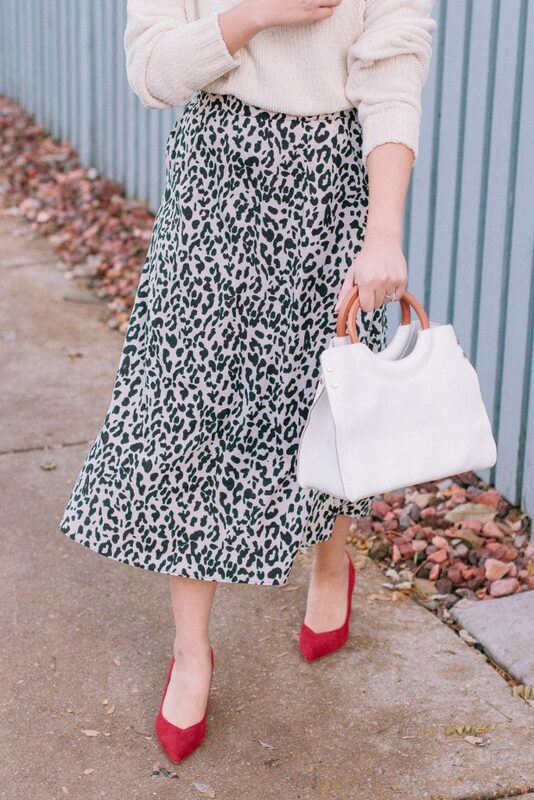 I love that you paired red heels with this leopard skirt! I love the length and the neutral color. That skirt is so fabulous! The only leopard pieces in my closet are shoes and clutches. I really need to get on this trend! Thank you Deborah! Oo those are great pieces to have in leopard print! loving the red details! super cute style! Such a fun skirt Rach! 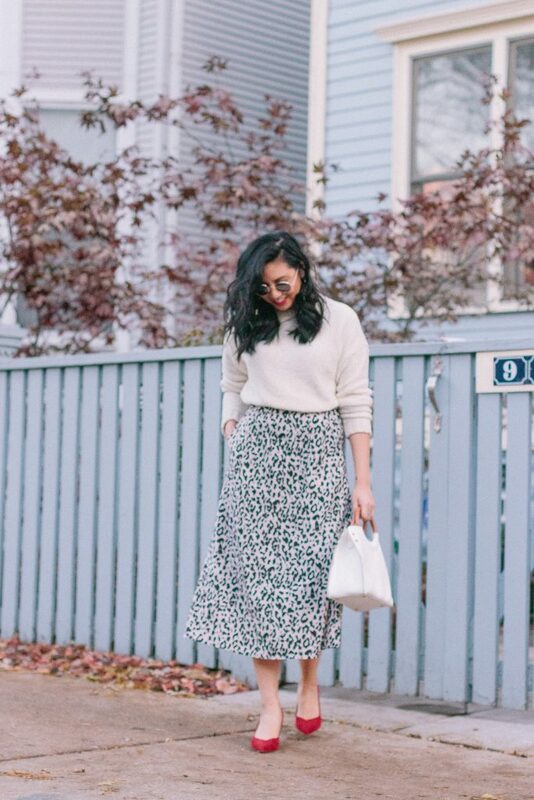 LOVING the leopard print of this skirt! The neutral tones are so chic and you can pair it with anything. That is a gorgeous skirt.. I love the color! LOVE LOVE the leopard print maxi skirt, Rach! SO chic! Between the leopard and the chenille, what’s not to love about this outfit?! Great minds think alike because I JUST got this exact same leopard skirt for myself! Now you’re giving me some serious styling inspiration. I can’t wait to try it out for myself! Swoon! Woohoo I can’t wait to see how you style it! Rach, you look gorgeous! 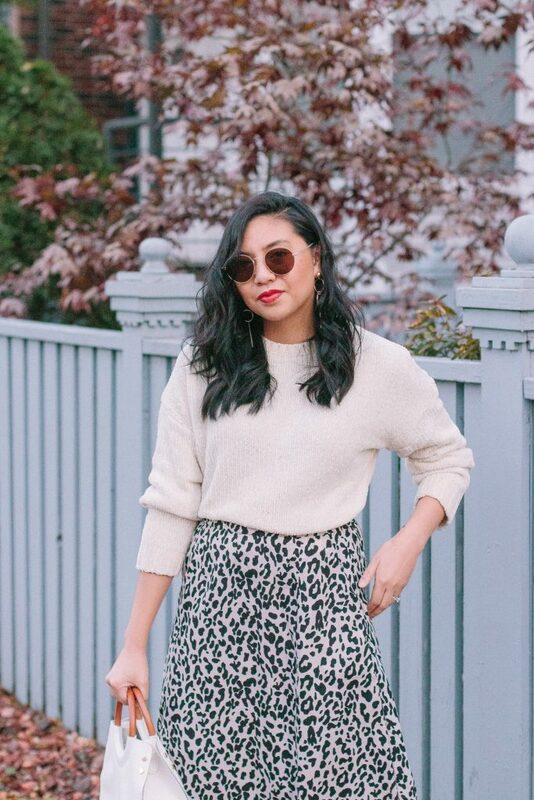 Love this leopard print skirt paired with the chunky sweater and red heels – so cute for the holidays! This is such a cute leopard print skirt!! I absolutely this print for Fall, and I love the length and color of this skirt! I love this look!! Leopard print is so in right now!! 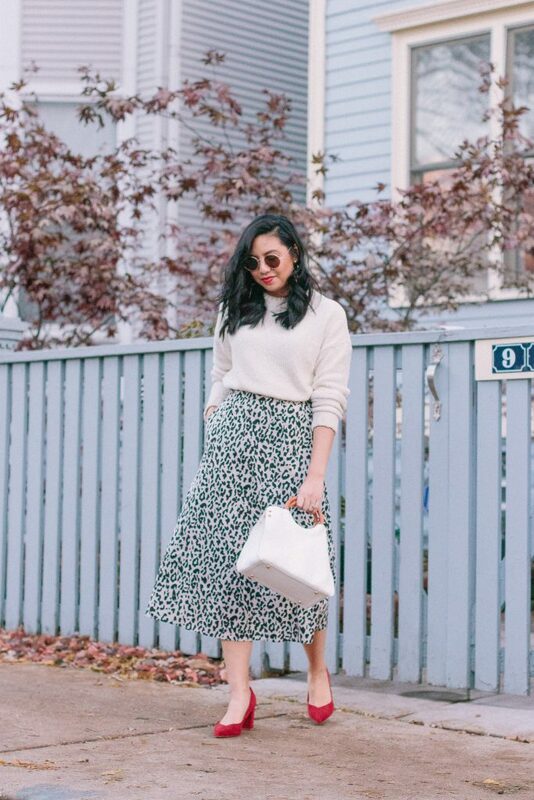 You styled this skirt perfectly, girlfriend! I was swooning over it on Insta! Aw you are so sweet Ashley! Thank you so much! Obsessed with the skirt! Animal print is so in right now and it’s perfect for this season! The skirt is beautiful; I really love that it is an “A- line” style skirt and the length is just perfect. Also, pockets are always a win-win for any outfit. Thank you so much! pockets are the best! Yess!! 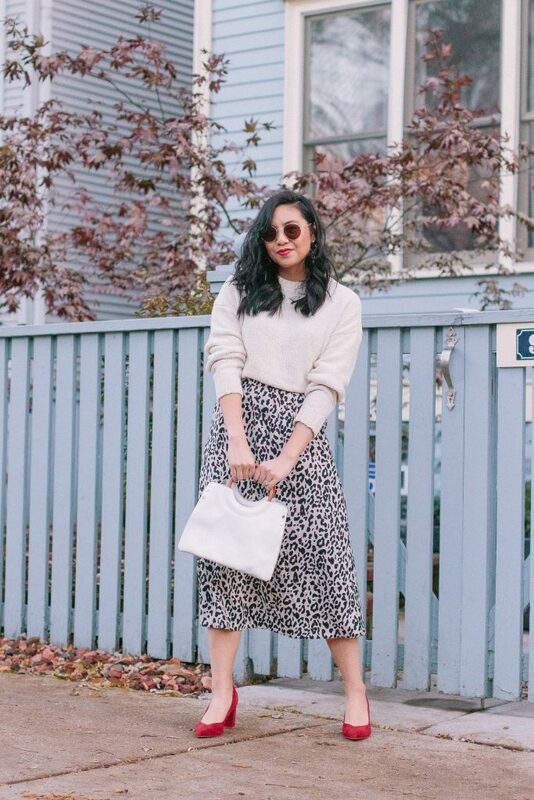 This skirt is fabulous and love it with the cozy sweater- I can’t get enough of leopard print and need this skirt in my life! Can’t go wrong with this print really, such a chic and sassy pattern. Super versatile too. Cute and sassy look you have here dear. Love the pop of red from your shoes dear.